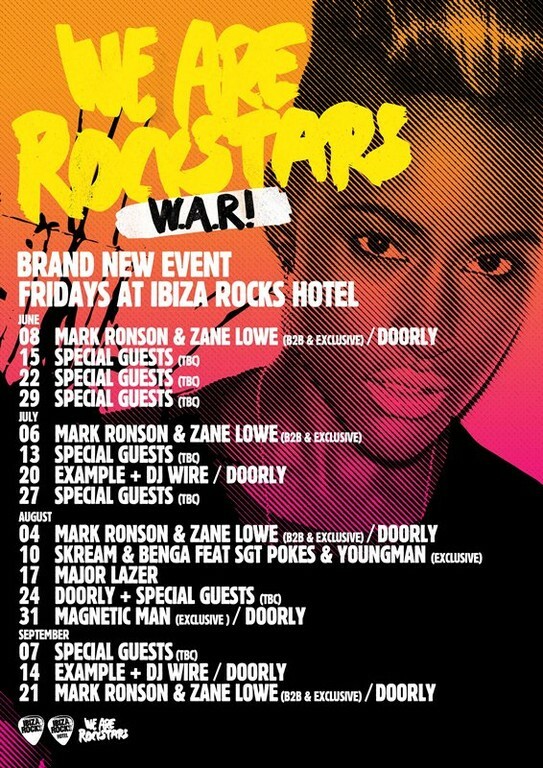 Courtesy of the folks behind Ibiza Rocks, a brand new night is about to hit the Balearics. WE ARE ROCKSTARS (W.A.R!) 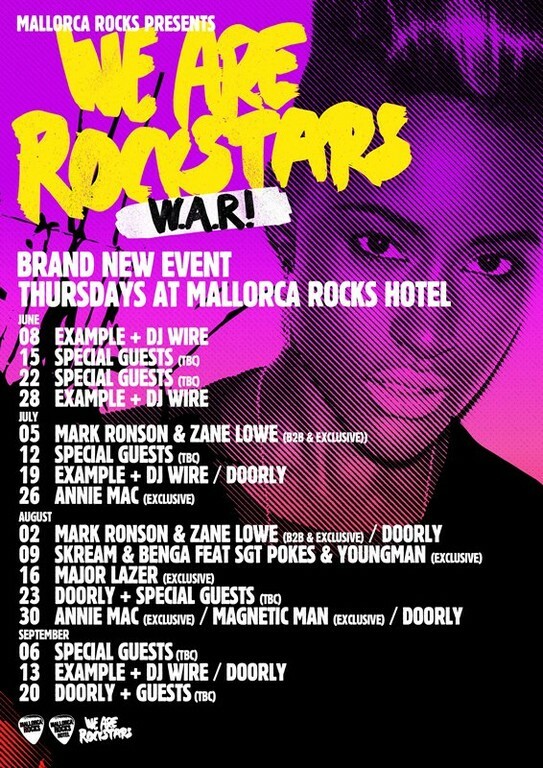 is the new electronic fuelled, DJ led night that will see a mix of the most influential and exciting names in electronic music take over the famous outdoor ‘Rocks’ stage - Mallorca Rocks Hotel (Thursdays) and Ibiza Rocks Hotel (Fridays) for 16 weeks straight from June through to September 2012. The electric, early evening, outdoor shows will welcome regular exclusive appearances by internationally renowned producer phenomenon Mark Ronson and Ibiza Rock’s Music Director and the UK’s biggest tastemaker Zane Lowe. The DJ duo will lead a line-up that also includes the first lady of Radio 1, Annie Mac, who will be joined on one of her two exclusive ‘We Are Rockstars’ shows in Mallorca by the pioneers of British dubstep Magnetic Man. Zane Lowe, Music Director, ‘Rocks’ Brand said: "As soon as we walked off stage at Ibiza Rocks last year Mark and I knew we had to turn it into 'something'. It's too much fun. We are excited to be back out at the I and M for 'W.A.R.' this summer." Mark Ronson said: “Playing with Zane last summer got me so hype, this whole past year, I feel like I've been playing at only 79.3% when I'm by myself... get ready for 203.9% Ibiza." The hottest duo in dubstep, not to mention the rising stars of Radio 1, Skream and Benga, team up with the longtime collaborator Sgt Pokes and the vocalist Youngman for exclusive shows in both Ibiza and Mallorca. Rocks’ favourite Example is set to make a triumphant return to the Balearics with his partner in crime DJ Wire, for no less than five ‘We Are Rockstars’ shows across both Mallorca and Ibiza. With the addition of this new weekly night the ‘Rocks’ Hotels are doubling their events offering and now hosting two major music shows per week! We Are Rockstars will take on the same 7pm – midnight slot as the ‘Rocks’ gigs, outdoor under the sweet Balearic stars, playing from the famous open-air ‘Rocks’ stage, with the same level of production put on for the Ibiza Rocks and Mallorca Rocks gigs each week. Wonderful post. A best place is tourism indeed the best way to know your feelings and god creation area . I love traveling and look over the web for finding useful stuff for the best facility provider.